Posted June 28, 2017 by admin & filed under Bondi View, Featured Bondi View. The Liberal Party appears to be placing pro-amalgamation candidates at the top of their ticket for Woollahra Council. If they are elected they could kill off Council’s High Court appeal to block a merger with Waverley and Randwick Councils. Liberal councillor Andrew Petrie alleges the Liberal Party is stacking a ticket of pro-amalgamation candidates in the Woollahra wards of Bellevue Hill, Cooper, Double Bay and Vaucluse to be pre-selected ahead of the election. 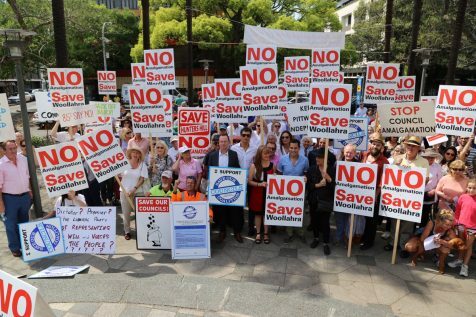 It is believed that a pro-amalgamation council could vote to halt any legal action and then rescind the previous Council’s non-amalgamation resolution, so that a forced amalgamation with Waverley and Randwick councils could proceed. Woollahra Council is one of few councils currently fighting the State Government’s plans for forced amalgamations in the courts. On May 12, the Council was granted special leave to appeal the decision of the Land and Environment Court in July last year where the council was unsuccessful in challenging the legality of the process of amalgamations, and was ordered to pay the Government’s costs. Nicola Grieve, secretary of the Local Democracy Matters resident’s group and a former Woollahra Greens Councillor says the community has already shown their opposition to any kind of merger proposal. A primary concern for Woollahra residents is that under an ‘Eastern Beaches Council’ rates would ‘skyrocket’ as the council does not calculate rates based entirely on land value as they are in Waverley and Randwick Councils. He says the NSW Government has failed by its own admission to find a solution to “the Woollahra problem”. Councillors and community are feeling confident after learning on Friday that the Councils appeal will likely be heard by the full bench of the High Court. No date has yet been set by the High Court to hear the Council’s appeal.